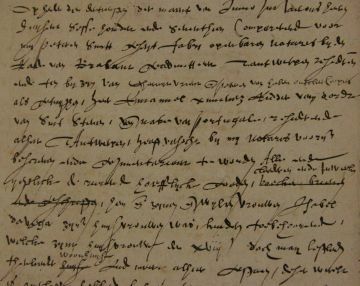 Conceived and edited by Christine Göttler (University of Bern) and Sarah Joan Moran (University of Bern/University of Antwerp), in collaboration with Sven Dupré (Max Planck Institute for the History of Science/Freie Universität Berlin), this website provides access to a complete transcription and translation of the 1617 probate inventory of the moveable goods belonging to Portuguese merchant-banker Emmanuel Ximenez and his wife Isabel da Vega in Antwerp. The translation of the inventory (completed by Sarah Joan Moran) is accompanied by analytical essays written by twenty-one authors on various categories of Ximenez's and da Vega's possessions, Ximenez's town house and country estate, his correspondence with the Florentine glassmaker Antonio Neri (1601-1603), and the world of the Portuguese New Christian community in Antwerp to which he belonged. The spaces mentioned in the inventory link Ximenez's Antwerp house, on the one hand, to the 'world spaces' that the Portuguese merchants (among them the Ximenez family), helped to shape and create through the extraordinary reach of their trading network; on the other, to the urban environment of the city of Antwerp, which due to its "great gatherings" of merchants, traders, craftsmen, and artisans of all nations, was considered a marketplace of the world.